This photograph, provided by Maureen Dark, is understood to show a winning Shove Ha'penny team in the Chichester Arms (now the Green Man Bar & Bistro), probably in the late 1960s. It was posted on our Facebook page back in October 2014. 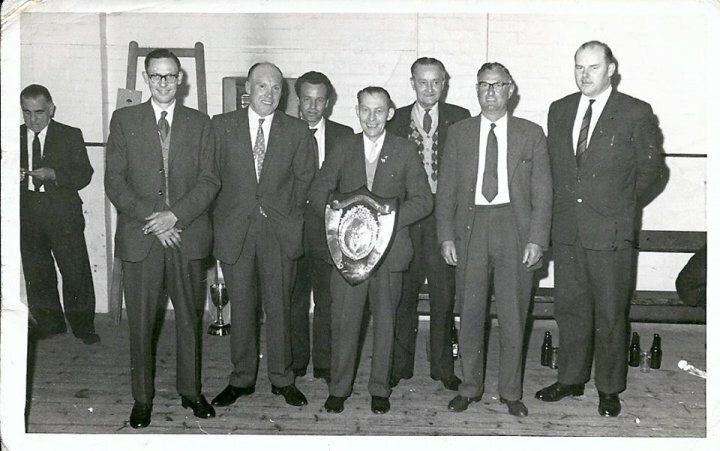 Identified in the photograph are Peter Williams (left - not the man in the background)), Arthur Thorne (holding the shield), Fred Andrews (2nd from right) and Tom Balman or Balment (joint landlord of the Chichester Arms and a Pilton bellringer - right). Fred Andrews will be remembered by older people as he pulled along his electric-assisted dustcart sweeping the High Street etc. years ago. We would be pleased if anyone could identify any others. The Shove Ha'penny Shield is understood to be in the Rolle Quay Inn, the current winter league holders in 2016. Thanks to Maureen Dark for posting it and Susan Mock, Maureen Dark, George Hammett, Sheena Ferguson, Peter Bray, Stanley Karniewicz and Joy Lawrence for providing further information in June 2016.